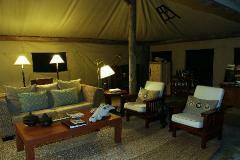 Kalamu Tented Camp is situated in the Luamfwa Concession in the southern sector of the South Luangwa National Park. 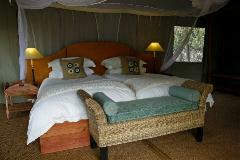 Accommodation consists of 4 Meru-style tents, each en suite with an indoor shower. The camp's dining and bar area are under a canopy of trees overlooking the Luangwa River and there is a plunge pool. Activities include game drives and game walks including a guided walking trail from Kalamu Tented Camp. The South Luangwa National Park covers about 9 050 sq km of the Luangwa Valley floor, which varies from about 500m to 800m above sea level. Near the banks of the Luangwa the land is fairly flat, and mostly covered with mature woodlands. There are few dense shrubberies but also open areas where beautiful tall trees stand, shading a mixture of small bushes and grassland. 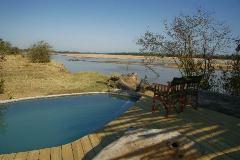 The highest concentration of wildlife is around the Luangwa River, with its rich vegetation. Wildlife includes huge herds of elephant and buffalo. The Park's dominant antelope species are impala and puku, with other antelope seen including the common waterbuck, bushbuck, eland, kudu, grysbok, oribi, reedbuck, Lichtenstein's hartebeest, sable and roan. Unique species such as Thornicroft's giraffe and Cookson's wildebeest can also be seen. There are also hippo and crocodile, and the main predators are lion, leopard, spotted hyena and wild dogs.